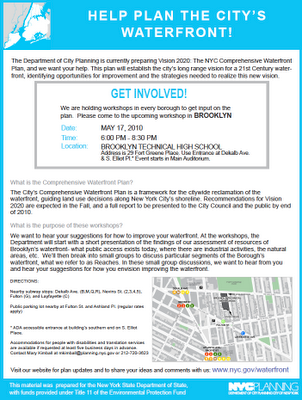 A View From The Hook: Have your Say on Waterfront Planning - Come to the Brooklyn "Vision 2020" Workshop, May 17th, 2010. 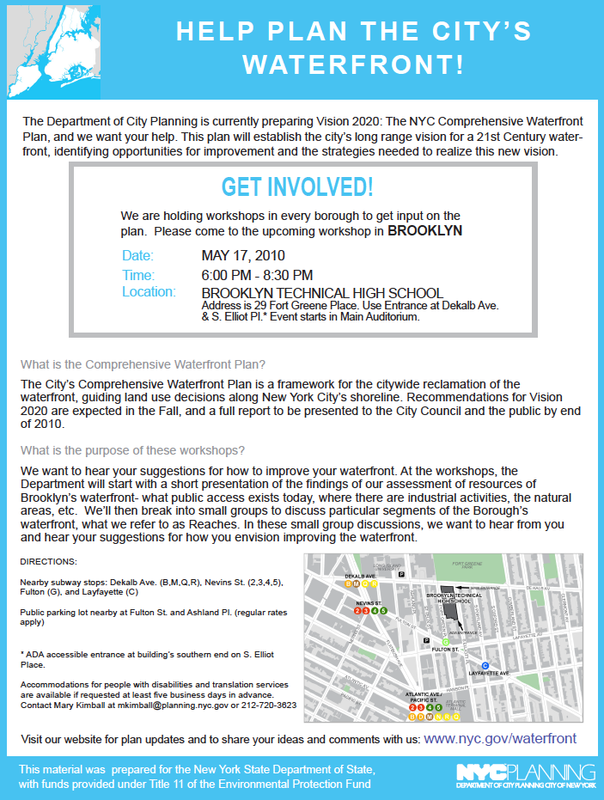 Have your Say on Waterfront Planning - Come to the Brooklyn "Vision 2020" Workshop, May 17th, 2010. 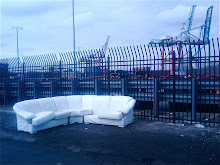 What do you hope to see on our waterfront in the future? Big box stores? Luxury condos? Cement plants? More trucks? More pollution? 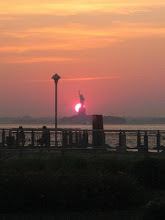 Do you have some ideas of what would be appropriate for the Red Hook waterfront? Do you like the idea of having more open space, public access (both physical and visual) and people-friendly activities and amenities? Do you hope for better waterborne transportation options? 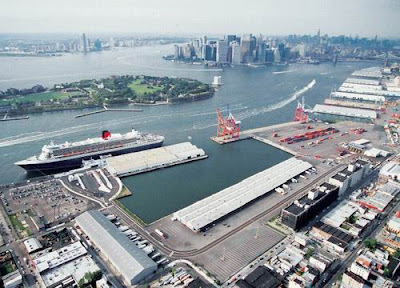 Are you interested in how planning for Red Hook's waterfront can be better connected to the future plans for Governors Island? Are you interested in the push for the "greening" of the various activities along the waterfront? Are you hoping for the City and its agencies to take a more balanced, resident-friendly approach to future planning along our waterfront and in our neighborhood? Does your small business hope to benefit from planning that better connects it to the broader neighborhood and beyond through the waterfront? As I mentioned in a previous post (here), New York City's Department of City Planning is holding meetings to gather input from the public to help shape their newly announced initiative, Vision 2020 - New York City Comprehensive Waterfront Plan. They held their initial meeting on April 8th (slideshow and summary of presentation here), but during May and June, as promised, the City is holding borough specific meetings - they're calling "workshops" - to concentrate on getting input regarding local issues. There is a list of upcoming meetings here. We will be holding public workshops in May and June in each borough to present an overview of each Borough’s waterfront resources and to discuss the future of specific waterfront sites. At these workshops, City Planning will present an overview of the borough’s waterfront resources and existing uses. We’ll then break into small groups to discuss particular segments of the Borough’s waterfront, what we refer to as Reaches. For each reach the groups will discuss opportunities and challenges for the future of specific sites along the waterfront. We’re also holding a sixth public meeting to discuss the Blue Network and other citywide issues. Dekalb Ave. & S. Elliot Pl, Brooklyn. Here's the flier. Click on it to enlarge, get transportation information and more. All this talk of Waterfront Planning reminds me, again, of the words of Bert Hooijer, professor of applied science at Rotterdam University in the Netherlands, who was in New York in September last year as part of the "H209 conference, a Trans-National Look at Modern Urban Water Challenges", a part of the larger Henry Hudson NY400 celebration. Professor Hooijer was on Brian Lehrer's show on WNYC (hear the interview here) and spoke of developing the waterfront in the "right way", with "multiple functions". He said the goal was to "get people to it" and to "combine several disciplines" to "develop the waterfront in a new way." Professor Hooijer went on to say, "the most beautiful thing to do is to bring the people to the water ... bring the local people to the water ... give people activities to do on the waterfront side" and "on the water" and to "use the quality of the people who are living next to the waterfront." Good ideas from the Dutch professor ... and surely good ideas for "Roode Hoeke".